Mrs. Beedle, my fourth grade teacher, was one of those no-nonsense, old-fashioned educators convinced that English always has perfectly sensible rules for every situation (we’ve talked about Mrs. Beedle before). When it came to teaching us about adverbs, Mrs. Beedle kept the lessons simple. She didn’t find adverbs especially interesting. As she refined her lesson plans year after year, she kept trimming back the time she spent on adverbs. Eventually, she was down to only two sessions to teach her students everything they needed to know about adverbs. And one of those lessons was wrong. “But, class,” Mrs. Beedle stressed, “Not all the words that end in -LY are adverbs.” And then the next panel of the blackboard would be covered with more examples—this time, adjectives (early, burly, silly, lonely, friendly, lovely, holy, and smelly), nouns (bully, ally, belly, family, monopoly, butterfly, and the proper nouns Wally, Kelly, Billy, and Polly), and verbs (reply, multiply, fly, dally, and bully again). Adverbs that modify verbs: The crickets were chirping loudly the night I ventured into the forest. A bear suddenly emerged from the bushes. I quickly ran home. Adverbs that modify adjectives: The doctor noted that the left ankle is seriously inflamed. It’s unusually warm and quite tender to the touch. The patient was furiously angry because the doctor kept poking her sore ankle. Adverbs that modify other adverbs: “We too often ignore our civic duty to vote!” the mayor announced. He spoke very loudly into the microphone, and winced when feedback whistled through the speakers. When he resumed speaking, it was less confidently than before. Unfortunately, Mrs. Beedle left out an important function of the adverb. In addition to providing a special refinement for other parts of speech, and adverb can modify a sentence as a whole. This special use is called the sentence adverb, reasonably enough. Commonly, the sentence adverb will appear as the first word in a sentence and be followed with a comma. Thankfully, you were able to get your family to safety, but you have no clue how your car suddenly became a fire trap. Luckily, you were not directly involved in the accident, but the sounds of the crash, of the pain, and of the grief will never leave you. Fortunately, we recorded this webinar so that even if you could not attend you can watch it at any time! Additionally, if you are a close relative of the person who died in this accident, then please start a live chat with us today so that we can give you individualized advice on how to protect your rights. Indeed, our quality of life has improved after the harsh economic downturn the past few years. At this point, you’re saying to yourself, “Wow! I’ve been using sentence adverbs all these years and didn’t know they had a special name.” Precisely! A native speaker of English acquires a commonsense understanding of grammar and can usually construct well-formed sentences without too much effort. 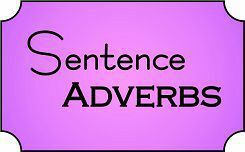 The Great Sentence Adverb Controversy: Dare You Use This Word? Obviously, not all adverbs are suitable to be used as sentence adverbs. “Obviously” works, for example, but “juicily” would be an odd and unworkable choice. Truly, therefore, ultimately, honestly, actually, certainly, incidentally, clearly, and many other words have often been welcomed as sentence adverbs. But one sentence adverb has provoked an enormous amount of controversy: hopefully. English purists were aghast. They claimed that the new usage was ambiguous; after all, the example sentence could also mean “You will enjoy this pie in a hopeful manner.” They found the new usage insincere, because the writer didn’t communicate his full intentions. But, one after another, language authorities decided the modern use of “hopefully” to be acceptable, with the Associated Press finally nodding approval in 2012. I’ll admit I’m not a fan of “hopefully” as a sentence adverb, at least in written text; it’s okay for informal conversation. And yet I often find myself agreeing with reformers who say it sounds stuffy and unnatural to rephrase a sentence to begin, “It is to be hoped...” I still encourage new writers to avoid “hopefully” whenever possible, but I just sort of sigh when they ignore my advice. I recognize that sigh, now. Good heavens, I’m turning into Mrs. Beedle. Need a Quick Tune Up of Your Prose? Foster Web Marketing provides ghostwriting services for website content, professional book writing services, and even editorial review of the content you or your team produces. Start an online chat with us right now or call us at 866-460-3724 to see how we can help you. Comments on this piece or any of our other blog essays are welcome and encouraged; we’d love to hear from you. Just add your remarks below.